"Never," my father cautioned me, "never, ever play leapfrog with a unicorn." It was advice I'd followed happily for most of my life, so what in heaven's name was I doing in the jungles of Rwanda? Here I was, climbing up the bamboo thickets of a volcano, breathless, scratched and providing a thigh-high feast for shiny black leeches, accompanied by trackers hoisting rifles so old they had probably seen service in the First Afghan War. I finally knew the unicorn was not a myth after all. I was riding him. Certainly, the sensation was marginally uncomfortable, but the rewards were great, an eyeball-to-eyeball encounter with the gorillas who live in the misty heights of the Virunga volcanoes in North-west Rwanda near the border with Uganda and the Democratic Republic of Congo. After flying in to Kigali, Rwanda's capital, my husband and I headed north-west towards Gisenyi, on the shores of Lake Kivu. In Gisenyi, we stayed in a hotel where the front- desk man wore a tie dotted with baby gorillas. As well he might, still under threat from poachers, the gorillas are now Rwanda's biggest drawcard and those in the tourism business know their value. Then it is on towards the Virungas, the chain of 15,000ft volcanoes stretching through Rwanda, Uganda and the Democratic Republic of Congo. Rwanda is still recovering from the 1994 civil war (and there has been some recent unrest in the Mikeno sector of Virunga National Park ) but the fact that there are some reasonable lodges on offer shows the country is moving on. A comfortable two-hour drive from central Kigali The Luxury Travel Bible suggests Sabyinyo Silverback Lodge which is right in the Virunga foothills and only a mile or so from the main entrance to the Parc National des Volcans. The nearby lodges will arrange your visit to the gorillas but we decided to travel independently. At the base of the National Park, we negotiated with trackers and porters to take us up the mountain. Carried out at a spanking pace, the walk led us through massed bamboo thickets on the lower slopes of Mt Visoke --there are lots of stinging nettles here and we were glad that porters were carrying our gear so we could leap over the hazard like a pair of ageing antelope. The climb, while strenuous, was not arduous, but one needs to be moderately fit and accustomed to exercise at high altitudes (we found our first gorilla at around 3,000 metres). Once we'd gained altitude, our porters fanned out with us straggling along behind. Suddenly, there was a shrill sort of growling, as out of the jungle came a troop of apes--we had gorillas in our midst. A lumbering female appeared, swinging around the bamboo as she meandered through the clearing. She headed for the silverback fast asleep in the shadows, tenderly cradled his head and glared at us fiercely. She was followed by another female, then another with a baby on board and a small male. The silverback stirred, thumping, belching, farting, finally awakening. He then climbed hand-over-hand to the top of the trees, where he settled in a leafy hammock of vines. The watched watched the watchers. For one magic hour, we observed these great primates going about their natural life. While they are accustomed to humans, they remain wild, putting up with us with gentle tolerance. On the following day, we met another gorilla family spending the day on the slopes of the Sabinio volcano. This time, it was a group of 11, including a huge silverback who came raging out of the bushes like a fury. He was around 180 centimetres tall--all coarse black hair and attitude. Hurtling from the misty shadows he charged us-- 300kg of sheer power. As we'd been told to do, we dropped to our haunches, desperately trying not to look at him. The tracker, obviously a madman, was laughing like the proverbial drain, even when the gorilla thumped him on the shoulder before wheeling off into the bushes. Not for the first time in my travelling life, I wondered what I was doing giving a flawless imitation of action woman when I should have been at home walking my cocker spaniel. Once we'd settled down, the silverback reappeared, this time benign and with his family. Their eyes like saucers, black furry hands emerging from every thicket, rolling, thumping, even fornicating, the hairy group played in the mist--an awesome sight. It seems the gorillas, still daily encounter life-threatening hazards, in the form of poaching of these gentle primates or civil unrest. Babies, however, are being born, though numbers are hard to trace. The usual form of census-taking is to count the gorilla beds. Each night the groups make up nests ... the males sort of hurl down leaves and sticks, while the females turn to making tidy little numbers with hospital-corner neatness. The girls also make beds for their infants. The Virunga Volcanoes is one of only two locations where mountain gorillas live, total numbers are currently estimated to be 680. 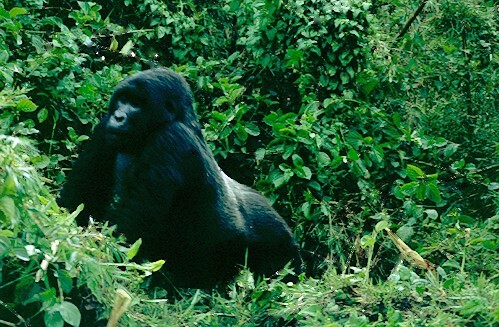 The African Wildlife Foundation (AWF) supported a new mountain gorilla census in March and April 2010. Later, back at Kigali, it's hard to accept the contrast of the bustling city with the peace to be found on the slopes of the volcanoes where the awesome gorillas play in the mist. But it was real enough. I have memories to prove it.